August is the time to treat the bees against Varroa infection. This mite, aptly named Varroa destructor, is one of the most serious enemies of the honey bee. It is a pest imported from the far east and has been spreading over Europe and the rest of the world for the last 40 years or so. Only Australia is free of this pest and I’m sure they hope to keep it that way. Without treatment your colony will surely die. Most likely not of the Varroa mites them selfs but of secondary/opportunistic infections like deformed wing virus (DWV). In the Netherlands organizations, like bijen@WUR, researches bee health and are on the lookout for causes of bee disease and research and test treatment plans. So far there is no sure way to be rid of the Varroa, all we have so far are means to keep the Varroa at bay. One of the treatments against Varroa is drenching your bees in formic acid vapor for about 14 days. The time to do this is after you have harvested the last of the honey so at the end of July or at the beginning of August. There are other treatments but this is article is about the treatment I performed. 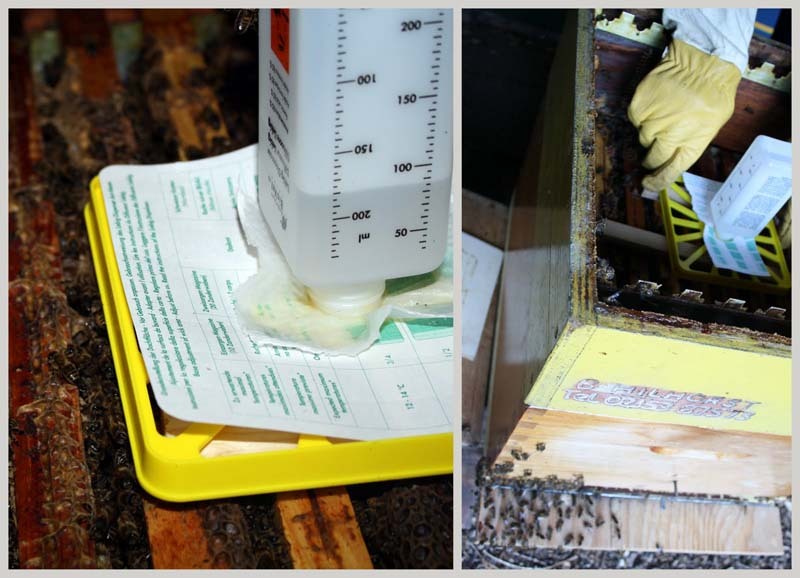 You can perform this treatment in a number of ways, the one I employed, which I think is the easiest and cheapest one, is by placing a clean household cloth on top of a queen excluder on the top brood box, placing an empty honey super on top and soaking the cloth in a certain amount (30 ml per brood box) of formic acid (60%). You will leave this cloth with acid in the hive for 4-5 days and repeat the procedure twice to get a treatment totaling about 14 days, to get all the mites also in closed brood. Perhaps an easier way but one requiring buying some gear entails buying a Liebig dispenser shown in the image below. It requires a little less effort and uses 85% formic acid in stead of 60%, which is the concentration that is readily available and so doesn’t require diluting. The dispenser is not expensive, so I guess that will be the method I will be employing in the future. I am myself the best example why not having to dilute you formic acid is an advantage. Having worked in chemical/biological labs for in total well over a year, and having instructed young students in lab practices, I didn’t think to much of working with 85% formic acid. As I had bought 85% formic acid and needed 60% it needed to be diluted, no big deal I thought until the bottle of formic acid slipped out of my wet gloves fell and bumped on the bottom of the bath where I was doing the dilution and sprayed 85% formic acid in my face. I got it on my cheeks and on my throat and a droplet in my eye. After dosing my face under the tap for about a minute, while all the formic acid went down the drain, I opened the bathroom door which my wife was about to break down having heard the commotion. After a visit to the doctor I had to have a large band aid covering my eye for a day and had to drop antibiotic liquid in my eye for three days. The burn marks in my face and throat were gone in a little over a week. It didn’t really hurt but the acid did burn in my eye. There is no lasting damage but I was obviously mortified that I could have been so clumsy and careless. I finally bought a new bottle and performed the dilution at a lab of a biologist friend, no drama what soever…and the procedure with the hives went down without a hitch. I could have done it easily in a sink, the bath was not the best choice. You just have to be careful, wear eye and hand protection and be organized. And if all else fails find a place that sells it at the right concentration for your method or use a method that uses the 85% concentration. So the take home message is; don’t spill formic acid in your eye, it hurts and is a major bother.